Nitori isn't mandatory, but she's pretty insane. Glass cannons are a lot harder to use in LoT2 and she deals glass cannon damage while being as durable as your main tank, while running a full attack build. Also once you start getting the better postgame gear she gets literally twice (or more) the attack of any other member of your party for a very significant portion of the game, which is quite frankly, broken as all getout and other characters don't start catching up until well into the 1000s. so whats the general consensus on labyrinth of touhou 1? is it better or worse than 2, is it still worth playing after 2? I've only played 2, so I don't have an opinion on 1, but I'll give my thoughts on 2. I like the game, and I love the variety it gives, especially with skills and gems to boost your characters. I'm of the type that like to use a set number of characters that work well together in a game with many characters so that I can fully invest in them and use their full potential. However, there are times where this was counterproductive, especially in postgame. As many people have said, it's horribly unbalanced, especially with bosses. You need a certain combination of characters to beat them, or I'm just a terrible player. Yeah, Nitori and Meiling tower above everyone else because of how insanely powerful they are. It's like if you're mising out completely if you don't use them, and them there are useless characters like Youmu. If the postgame bosses and characters were better balanced, this would've been my favorite game of all time. Personally, I wished the postgame would better integrated into Plus Disk, like how the upper floors and basement floors were connected. I read from one of the posts that TH L1 did a better job at character balance than 2, but the too simple design drives me away. I'm not really tempted to play it anytime soon. The original postgame (non-plus) is ridiculously unbalanced and I shamelessly overleveled to wipe them out when I was doing my second play with Plus Disk. It was vaguely OK when they were the BIG SUPERBOSSES but once they're not the end of the end, it's way too much. The plus disk bosses are way more handle-able. Futo is a huge exception holy crud, but other than that. When you're killing all the end bosses with 0~2 character losses in a game like this, it's definitely sort of disappointing. King has some presence, but his pressure mostly just comes from the fight having forced time limits between a party-one-shotter and a fullheal that you can totally avoid. It'd be interesting if the party-one-shotting move was less avoidable, considering Akyuu's invincibility and resurrection/guts/etc exist, along with his attack-up afterwards turning up the heat. I guess that would somewhat restrict party composition though, and that late in the game it starts to be a lot to ask people to possibly swap in other characters. Ah yeah that was me. Going off the levels in Keine's Library (184), the bosses look like this. Though, I've no idea how the stats are calculated, so in practice the HP difference might be totally unalike. The levels shown in Keine's Library for Corridor bosses scales up with your progress in the Infinite Corridor, so I tried experimenting with that a little to see if I could figure out the HP scaling formula, and there was no really easy way to figure it out, it wasn't anything simple like "X * level" increases. I think that different level ranges have different scaling too, which further complicates things. As I recall, 3peso had to adjust Corridor enemy ATK/MAG at the higher levels twice (IIRC) because it was getting out of control. On the topic of base game's postgame, I didn't think it was that bad outside of The Great "C" (solely because in theory one could use Black Universe and another "C" Falling From The Sky to unavoidably defeat a character, but they're more likely to just repeatedly Black Universe the same character) and Guardian of the Crystals (and looking back at how I fought it, I see tons of room for improvement in my strategy, although I think it'd still be one of the harder bosses in the game), but admittedly I don't really remember it that well because I just beat the Shadow bosses without even considering trying to learn the fights and record them. Adding in my 2 cents. I think Labyrinth 2 is the far better game overall, but it's missing some elements of the first game I dearly miss. Labyrinth 2 has (for my money, anyway) a far better roster of characters, many more interesting ways to use each one, and double at LEAST the amount of interesting strategic choices to make for each one via the Skills menu. Labyrinth 2 even goes the extra mile by making each and every character worth using at some point, I think in a typical unlimited playthrough of the game, I get legitimate, natural use out of every single member in the cast, until the plus disc characters anyway. In labyrinth 1, that used to never happen for me. It was so much more rigid, basic, and clear-cut who you should stay with and who was just kind of not worth it. What Labyrinth 2 lacks, however, is some of the brutal battles of the first game. Despite Labyrinth 2's much more complex and free system, or maybe even because of it, it's very rare to have a boss fight that actually poses a significant problem for you to get around. There are exceptions of course, and there are a few instances where the enemy strongarms you into a particular strategy that can be "fun" to figure out, but for the most part you can tackle any boss in 2 "easily" in a dozen different ways ore more, between all the characters, their skills, situational and permanent boosts, who has what items, subclasses as a whole... Labyrinth 1 ends up being harder to overwhelm just because you have significantly fewer options to power everyone up on your side, so if Labyrinth 1 has a gimmick fight, it's REALLY something you have to buckle down for and struggle through. 2 doesn't really have these. Especially apparent in the endgame, 2 more often than not has "stack ALL THE DAMAGE on 1-2 star players via every means necessary, and wipe." In the end, I'd rather play 2 any day, but labyrinth 1 still has a brutal appeal to it I wish carried over into 2 a bit more often. The closest Labyrinth 2 gets to feeling like the first game in my eyes, is the mirror/magatama battles on floor 12, and the final boss on floor 20. I totally agree with the sentiment that the first game had way better boss fights, though. LoT2 does at times, but there's definitely some problems in the long run. And, the corridor HP scaling seems fair to assume is (was, hopefully, in the latest patch) insufficient, considering that even if we don't know direct data, we -do- know all the late bosses fell down way faster than it felt like they should have. LoT1's characters were a LOT less balanced between each other than LoT2. There were a lot of characters which were simply outclassed in nearly every possible way. In LoT2, you have 2 more elements, skills which enables chars to do absolutely unique things (like Cirno's unresistible SPD debuffs, or Reisen's Intense Vertigo, or Maribel's "treat enemy buffs as debuffs", and so on). In LoT1, chars basically had only 4 things they could do: deal damage, heal, tank, or buff. Sometimes status/debuff. That's it. And there was a lot of overlap between the chars, with some getting the short end of the stick in a pretty ugly way. Reimu: By far the best healer in the game. Impressively balanced stats mean that she can easily stay on the frontline while supporting her team, and the overall generous multipliers of her spellcards allows her to deal consistent damage for a healer/support character. Evil Sealing Circle provides paralysis support, while Great Hakurei Barrier helps buffing the team's defenses. Reimu is possibly the best character in the game overall, and whether she lives or dies generally makes the difference between winning or losing battles. Nitori: By far the best nuke in the game, and it's non-elemental to boot. Only Flandre, Yuuka, and Marisa can outdamage her on a single blow, but their horrid drawbacks don't allow any of them from spamming their attacks like Nitori can. Optical Camouflage counteracts the low delay of her Megawatt Gun. Her bulk isn't great, but still okay for the best damage dealer in the game. Rinnosuke: The MANnosuke is an impressively well-rounded char. World Shaking Military Rule is a great opening move against nearly every boss, and Rinnosuke's high speed often allows him to act before his allies. Shining Stars of Traumerei can deal as much damage as the likes of Youmu or Yuugi, while Start of Heavenly Demise is a good backup non-elemental option. What defines Kourin, however, is his ability to act both as a real nuke AND a real tank, while boasting what possibly is the best opening in the game. He might technically be master of none (he doesn't hit as hard as Nitori, nor does he tank as well as Keine), but his combination of feats actually makes him a master in a way no other char in the game can possibly emulate. Keine: If Reimu is the best healer, and Nitori is the best nuker, Keine is arguably the best tank in the game. No, she's not as self-sufficient as Meiling, but she has incredibly powerful buffing options for keeping your entire frontline fully loaded. And, as if this wasn't enough, she has defensive stats that (when taking levelling rates into account) eclipse every other tank in the game except Meiling herself - while still boasting a surprisingly decent speed stat. Tanks are defined by their ability to balance bulkiness (being able to take the boss's attacks) with efficiency (making good use of all those turns they get), and no char gets that balance as well as Keine does. Shikieiki: Shikieki's Last Judgment is simply amazing. Not only it hits about as hard as Youmu's Slash of Eternity (and noticeably harder than Yuugi or Suika), but it is fully defense-piercing AND non-elemental. By virtue of this alone, Shikieiki is the only char on the entire team who can ALWAYS deal solid damage on bosses, no matter what. This is why every competitive team should have a slot for her. Youmu: Has the 3rd strongest, drawback-less nuke in the game after Nitori and Suwako (and, unlike Suwako's, her nuke is non-elemental), coupled with excellent HP and defense which allows her to stay in the tank spot comfortably when needed. Yuugi: One of the best single-target nukes in the game (though not as strong as Youmu, Nitori, or Shikieiki), along with high HP and Def which allows her to tank if needed. Has a less powerful, but still good option for non-elemental damage. Irremovable Shackles can cause PAR and PSN, but unlike some other PAR-inducing moves its damage output is terrible. Ran: One of the best tanks you can choose from. Her AoE buffs are a bit on the slow side, but can buff even the backlines, making her a great choice for tanking bosses in the first few turns. Her bulk isn't amazing for a tank, but still more than enough with HP investment. Flandre: Lavatein is great for farming purposes, while Starbow Break does solid damage to bosses, is non-elemental, and has a very fast delay for an attack hitting almost as hard as Yuugi's Knockout in Three Steps. Despite SB's recoil, Flandre's high HP allows her to stay on front and keep attacking, but she's heavily reliant on Reimu to be effective - no other healer can realistically keep her up as well as the rest of the front line. That being said, Reimu is a char you'd want to use anyway, so don't let it deter you from trying Flandre either. Yuyuko: By far the strongest mage in the game. Her stats are nothing to write home about, but Saigyouji Flawless Nirvana is simply amazing, with a crazy multiplier and a surprisingly low delay for such a nuke, making Yuyuko's "actual" speed almost on par with the likes of Nitori. And while her physical bulk is average, her magical bulk is great too, allowing her to tank MAG attacks better than the likes of Youmu or Yuugi even when factoring HP. Mystia: Possibly one of the most underrated characters in the game. Her stats may appear mediocre, but her excellent levelling rate goes a long way balancing them out. For a low-delay attack, Ill-Starred Dive is incredibly powerful (especially if compared to something like Cat's Walk or Flight of Idaten). But Mystia's real claim of fame is her Midnight Chorus Master. Not only it hits as hard as you'd expect a good nuke to (and is non-elemental to boot), but also comes with a PAR chance attached, allowing Mystia to suddenly turn the tables on nearly any opponent with a little luck. Minoriko: Possibly the best healer after Reimu. Wish for Abudant Harvest may be single-target, but its short delay allow Minoriko to keep multiple chars topped in a way other single-target healers cannot. Falling Leaves of Madness deals chip but useful and fast damage, while Promise to the Wheat God keeps tanks buffed. 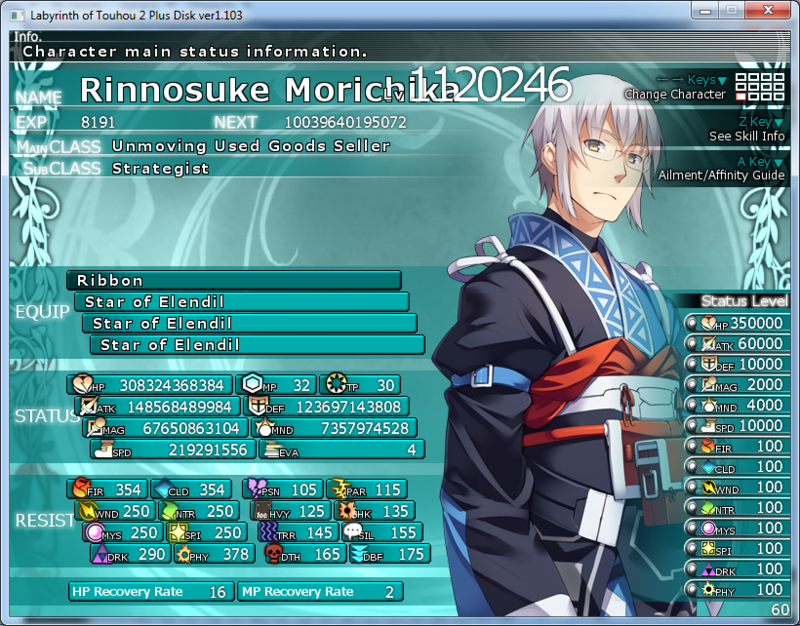 Minoriko's bulk is kinda mediocre, but her levelling rate and excellent healing skills make up for it somewhat. Still, more of a backup to Reimu than anything. Rumia: The only other real AoE healer besides Reimu. Sadly, even with solid investment, Demarcation rarely heals more than 30-35% of the HP of a nuker, and is absolutely incapable of keeping tanks topped in the same way Reimu or Minoriko can. On the plus side, however, Moonlight Ray actually allows Rumia to dish out solid damage for a healer, though she won't get many opportunities to do so due to her need to constantly spam Demarcation to keep up with most bosses. Komachi: Impressive bulk thanks to her HP score, and surprising (but not actually excellent) single-target damage output with Scythe that Chooses the Dead. Good choice if you want a tank who can actually deal damage (and do some minor status support if needed), though there're probably better options for damage dealing. Suwako: Strongest drawback-less nuke in the game after Nitori. Unfortunately, held back by subpar bulk. However, if you can keep her alive, she's easily one of the best nukes in the game - though it should be noted that, unlike many other nukers, her nuke is not non-elemental. Suika: Similar to Yuugi in many respects - same multiplier on her nuke, same HP growth. Unfortunately, the differences - slower levelling rate (compounded by slightly lower ATK), lack of non-elemental backup attack - can't be ignored. While Suika can work as a nuke (and her Missing Power buff becomes slightly more effective the less Speed counts at higher levels), she still is a fair bit worse than Yuugi and other major nukes. Kaguya: Hourai Barrage hits very hard, and ignores defenses to boot (though, unlike Eiki's Last Judgment, is not non-elemental). Buddha's Stone Bowl also can help if you need an emergency second heal from Reimu. Unfortunately, all this is set back by an awful physical bulk, even worse than Suwako's, which makes keeping Kaguya's alive against the likes of WINNER a chore (and a magical bulk which is still significantly worse than Yuyuko's). Kaguya is not unusable, and the reward for doing so is significant, but the risk factor is too big to ignore. Yukari: Great defenses for a tank, a good defensive AoE buff, and a great support option in Yukari's Spiriting Away. Unfortunately, however, the way Speed scales in the game weakens its effectiveness, especially compared to actual offensive buffing. Still a good option for tanking, especially at lower levels. Renko: Another good, purely-supportive tank. Sadly, even at high speeds, the delay cutting effect of Charge is too large of a flaw to ignore, but its ability to instantly top the buff levels of the entire frontline shouldn't be underestimate - and when she's not busy buffing, Galaxy Stop is a good way to fish for a PAR chance. Maribel: Her stats may not look impressive, but Overflowing Unnatural Power is so good that she actually can be usable. Not the strongest damage dealer in the game, but even at high levels, her superior speed and low delay allow her to deal overall as much damage as a medium-power nuke like Yuugi or Suika. Furthermore, her debuffs may be weak, but she gets multiple opportunity to apply them and stack them to decent levels. Kanako: Unlike other middling, bulky mages, Kanako actually has a real nuke in Beautiful Spring Like Suiga. While she won't do as much damage as the likes of Yuyuko, this is somewhat countered by her excellent bulk, which allows her to stay out comfortably in a way few other similarly offensive chars can imitate. That being said, she's no Rinnosuke - while her combination of bulk and offensive potential is interesting, she doesn't really shine at neither, and doesn't have anything other than damage to bring to the table (furthermore, her non-elemental option is very mediocre). Yuuka: Master Spark is great for farming purposes - and unlike Marisa, she's not limited to single-target encounters. She's also far bulkier than the other Master Spark user, and more than capable of staying on the frontlines. Unfortunately, Flower Shot's damage output is kinda pathetic even when factoring her low delay, meaning that she can't work as well as Flandre on boss fights (though, at least, she's less dependant on heals to do so). Marisa: Master Spark is useful for farming most 30F encounters (except those involving multiple enemies like Eientei), and no character can muster as much damage as Marisa in a single blow. However, her horrible bulk, combined with Master Spark wiping her SP whenever she uses it (and her other spellcards having awful multipliers) means Marisa is of little to no use in prolonged battles like WINNER. Sakuya: Lunar Dial is just about all she has going for her, but speed buffing becomes progressively less powerful as your level increases. Her damage output is pitiful, and she has no other relevant options to bring to the table. Meiling: She can tank hits, but she can do literally nothing else well. Healer is almost useless once every char has status immunity in the late-game. Mountain Breaker has good piercing factor but bad ATK multiplier, which is not helped by her mediocre ATK value. Colorful Rain is good, but again, this only helps her tanking hits, and there're plenty of chars who can actually support their team (or doing relevant damage) while doing so. Cirno: Can debuff speed faster than any other char, but useless otherwise. Bad bulk, bad damage output, and there are tons of better characters who can deliver paralysis. Aya: Pretty much in the same boat as Sakuya. Good if you need SPD buffs, but SPD buffs are not as good in the lategame, and that's all Aya can really do compared to other chars. Iku: One of the best single-target offensive buffs in the game. However, still pales in comparison to the likes of Keine, who can keep up an entire frontline buffed. Furthermore, Iku's damage output is mediocre, and her bulk is good but not outstanding. Sanae: Yasaka's Divine Wind is a powerful heal, but unfortunately its high delay means Sanae has a hard time solo-healing the front line against hard-hitting bosses. Miracle Fruit is a decent single-target buff, but, again, there are better options for buffing as well. Her bulk is mediocre, and her damage output even more so. Reisen: Her damage output is mediocre, even with Grand Patriot's Elixir - meaning that, if you use her, you're basically using her for Discarder's debuff. Even so, Maribel is probably a better option, unless you really need your debuffs to hit reliably. Eirin: Hourai Elixir's %-based heal, overhealing, and high delay means that Eirin, like Sanae, is good at keeping up tanks but can't support a front line on her own. Astronomical Entombing does decent damage for a healer, though. Tenshi: Her bulk is quite average despite her high defensive stats, and her damage output is just sad. Useful for removing debuffs, but can't do so reliably enough to easily justify a team slot. Rin: A bit better than Cirno, in that Blazing Wheel can actually deal good damage, but still a bad choice for similar reasons - bad bulk, less use for fast switchers in the late-game, lack of other relevant options. Utsuho: Her only perk, over other similar good mages with bad spellcards, is Giga Flare's piercing effect. Besides that, though, there's little Utsuho does that can't be accomplished by other, stronger characters. Remilia: Spear the Gugnir's multiplier is absolutely horrible, and she has nothing else to boast about. Buff support is easy enough to come by that Curse of Vlad Tepes hardly counts (and, even so, there are better self-buffing characters too). As a tank, there are way better choices - whether you want a damaging tank or a supporting tank. Patchouli: Horrid bulk means she has a hard time taking blows from nearly anything. Her damage output is mediocre, due to the low multipliers of her spellcards. If you really want to use a slow magic attacker, both Kaguya and Yuyuko are far better alternatives. Alice: Decent stats, but subpar damage formulas. Not as bad as Patchouli, but still cleanly outclassed by more powerful mages. Wriggle: If you really want a char who can use Poison, use Yuugi or Shikieiki. Not much else to say about. Mokou: Another mage with decent stats, but mediocre spellcards multipliers. Not much else to say. I'm not sure if a similar ranking could be done for LoT2 chars, even once we get to see the end-game, due to how more synergy-dependant they are (whereas LoT1 chars were much more easily gaugeable on their own). But, if I used the same criteria as above, I doubt I'd end up putting any char in Rank D or S, in the end. Sure, there are some chars which are better than others, but I can't think of a single char who's truly outclassed at EVERYTHING - nor can I think of a char who's so good that she should be an automatic entry on any team (even Nitori slowly loses gas as levels raise, and I wouldn't rule out the possibility that, in the long run, a team with well chosen kin synergies could end up slotting her out with no regrets). Well, it's definitely a list focused more around Winner farming It's interesting to see how things are considered that far in the game, though. For example, I compiled a similar list after playing the game 3 times (once on Special Disk) and I'm a heavy numbercruncher and wiki trawler, and there's a lot of differences. (although the main concept is about the same) For example, over the course of my Special Disk playthrough, Mannosuke was actually kind of disappointing because his damage is rather eh and his tanking was similar. He did both adequately enough, but Alice actually surpassed him in both defensive stat total and in damage. (especially when re-evaluated around Winner time; I used both for all of Plus Disk) Of course, she doesn't have his buff, and his composite attack may become much better in mega-winner who probably has pitifully irrelevant defenses . Of course, there's also that many characters are really good for much of the game but obsolete in the end, like Chen who has insane dps that falls off with speed scaling (and the added difficulty in keeping her alive). And Wriggle's poison damage is insanely good in maingame, but poison is utterly useless in Plus. I'm assuming also that slow-level, high-base characters in general just come out ahead in mega winner level territory, because you get higher numbers off of some than I expected, mainly Rinnosuke. Aya's the Chen of Plus Disk imo tho, Peerless Wind God is REALLY good... until you farm winner enough times that high speed is totally irrelevant (at which point, yes, you just want big nukes). Sadly, half the plus bosses have high WND affinity. She -still- did similarly as much damage as my other attackers on bosses with like 150~200 affinity though. Seriously. Although I'd still wager a few changes in your list. For example, at the point of Winner, the Mind stat can be practically replaced by pumping up affinities. Especially due to farming off the major affinity equipment from, hibachi I think? It's been awhile. Yuugi is about as tanky as Meiling, but in a full atk build, and affinities replaces her poor MND stat entirely. IIRC I watched a 256 winner kill video and was like, "Huh, but I only killed him 10 times and think my affinity stats were higher than that!" XD This is probably also why you rank Keine higher than Iku; for much of the game, Iku's insanely high MND stat is a key selling point, as MND-Iku has comparable amounts to a MAG-build Patchouli. But high MND is really not that valuable in Winner farming because affinity. You can probably also afford to keep out more offensive characters vs. supports and tanks, making a multi-target buff more useful. Generally throughout the game you need a big tank at the left, one support, and one or two nukers at a time (often needing to swap out a high-delay attack) so Iku's big single target is really all you need. I was excited to try Keine and her defenses were... certainly passable enough as a second slot tank, but not particularly impressive either. She really would have been vastly more useful during the main game, but she comes in so late. I wouldn't say it's focused SOLELY on WINNER farming. It's true that most of my evaluations start becoming more and more true as you progress through WINNER wins, but you can already start seeing signs of it as soon as you start farming 30F (so, around level 450+). As far as Rinnosuke goes, I think it depends on how you handle library numbers. 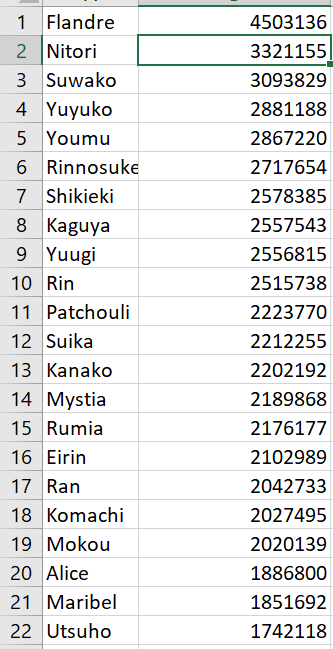 Namely, Rinnosuke has much cheaper library levels than the likes or Minoriko or Rumia, because in LoT1 (for some reason) library level costs are inversely proportional to the stat score itself - the higher your stat growth is, the lower it costs to increase it even more with skill points. I generally made it a rule to "harmonize" library levels around their costs, rather than the actual levels, in order to spend skill points more efficiently. This basically ends up exacerbating stat differences significantly, making chars like Rinnosuke actually shine as they're supposed to and making things like Youmu's magical bulk vs Yuyuko's magical bulk actually apparent, even at very high levels. As for Wriggle... Wriggle's problem is not simply that Poison is bad, but that there are other characters - such as Yuugi - that can apply PSN as well as being useful, whereas PSN is all Wriggle has going for her. Sure, Wriggle's PSN application chance might be higher, but unlike in LoT2 where it runs out quickly, in LoT1 PSN lasts for a long time, especially at Plus Disc levels. As I noted above, it has more to do with how I spend skill points. Indeed, since the xp required to level up caps at around level 2900 (which, btw, is STILL not enough to kill WINNER beyond 200th time or so), characters with a faster level rate actually start growing a bit faster in the very end. Have you tried Mystia instead? Sure, she might be a bit slower, but her own fast-hitting attack at least is non-elemental (and has a slightly better multiplier), which I'd happily take over Aya once I start farming 30F with its incredible diversity of enemies. I didn't mention affinities, because I just took as a given that you'll get all your chars at 500 affinity (which is trivially easy in LoT1, considering 3X MGL gives you +300 to affinities, meaning you only need to up your levels to 200). Though, even then, as long as you give library levels proportionately to stat growths (as I've explained above), you'll still see significant differences between, say, how Shikieki or Yuyuko tank WINNER's Wand attacks and how Youmu or Yuugi do. As for Iku vs Keine... the fact is that (1) Keine has much better physical bulk, and the strongest attacks which tend to hit your tank at those levels (like Ringil) are physical, and (2) Keine's ability to buff the entire frontline instead of one char at a time makes a large difference when you're running a frontline of Keine/nuker/nuker/Reimu, as you probably should once you're that high in level. I know many of you seem to prefer focusing on one attacker only, but that's a strategy better suited for low level fights or fights vs high defense enemies. Heck, there are times where, if I'm fully buffed via Ran, I just put Youmu or Yuugi in the tank slot, and Nitori + Shikieki or Yuyuko in the other slots, with Reimu keeping them up while I bombard the opponent repeatedly with nukes (sometimes, if I'm rushing, I replace even Reimu with a 4th nuker). Uh, I wonder if you have actually ran damage calculations with some of these chars - I mean, under which conditions would Remilia even remotely outdamage Rinnosuke? Even Scarlet Gold Sword easily outdamages Spear the Gugnir... Also, you don't seem to account at all for the durability of characters in your tier list - even something like WINNER's Wand can near floor the likes of Kaguya or Patchouli (despite their seemingly good MND) - I'd rather use Yuyuko who not only is much bulkier than both of them but also heftly outdamages them except perhaps against very high-MND opponents like the 28F boss. But once you reach 30F, even high-MND opponents like Tenshi will take more damage from Yuyuko. I didn't calculate her because, while her Master Spark's "potential" would prolly exceed even Flandre's Lavatein, the rest of her package is way too subpar - similar reason why I didn't calculate Yuuka. As for Reimu, well... back when I wrote this, I did not expect that her damage output would be actually decent, if I redid the calculations today I'd surely include her. I was working on calculating character damage potential for Labyrinth of Touhou 2 back when 1.103 was the latest update, but I gave up around Satori (doing them in in-game order). There are a lot of variables so I generally just used the most favorable ones. I did complete Satori's full list of available spell cards though, minus Hexer/Toxicologist spell cards. Of course, I also did Iku and Tenshi. Might be something worth resuming, I stopped doing it because I didn't think it'd be useful to anyone, but maybe that's not the case. I wouldn't say it's focused SOLELY on WINNER farming. It's true that most of my evaluations start becoming more and more true as you progress through WINNER wins, but you can already start seeing signs of it as soon as you start farming 30F (so, around level 450+). Yeah... which is only one floor out of the game. A well made team can -beat- winner at 450~500, already. Few people play past that point, and many aren't changing their team much at the 30f+ point. When making a tier list, I wouldn't significantly consider this part of the game at all, unless the list was specifically aimed at winner farming. I do try to remember that your tier list is focused around "lategame" performance, but if you consider that to mean "plus disk performance", it still seems heavily slanted towards winner over anything else; my list on the other hand accounts for most of the game where you have the freedom to choose between most of the cast, so maybe past the middle of main game I guess? As far as Rinnosuke goes, I think it depends on how you handle library numbers. [snip] This basically ends up exacerbating stat differences significantly, making chars like Rinnosuke actually shine as they're supposed to and making things like Youmu's magical bulk vs Yuyuko's magical bulk actually apparent, even at very high levels. Stats-> Rinno: http://puu.sh/B4VQY.png Alice: http://puu.sh/B4VTM.png They're both at lv253 on most stats, coincidentally, as they have the same library level rate (for Alice's better stats like MAG/MND at least). And, Wriggle's problem is -absolutely- that poison is bad. Parallaxal actually did a video where he aggressively applied poison for an entire long postgame bossfight and then went back and counted damage numbers, and the poison damage totalled at... about one Megawatt worth. It was not a short boss, so that was utterly pathetic. Poison is, however, excellent and worthwhile before Plus Disk. As for using Wriggle for it, all ailments have identical accuracy in LoT1 (other than DTH) but I think the consensus had been that higher strength poison dealt more damage. This was a VERY long time ago, mind you, and it's also very hard to test poison damage in LoT1 in general, so I can't guarantee this was accurate information and whether people had actually read about or tested it. I feel like it was the case though??? Aya and Mystia don't even factor into 30f. The frontline was Yukari, Nitori, Iku and Kaguya, in that order. I tailored their Speed to the correct amounts, and it'd go something like Stickleback->Megawatt->Stone Bowl->Megawatt->Spiriting Away->Megawatt->Stickleback->Hourai Barrage, if they lived that long. Or, Nitori's alltarget attacks if necessary. There's no chain bonus in LoT1 so it was fine to go back home now and then for SP. Chen was a run-away for awhile due to speed, but for the most part, this utterly annihilated 30F. I don't recall how long it took to work perfectly but I think I was farming 30F rather than liliths, before I hit 400, and as my level rose I was able to take out steps to make it faster- I recall using Yuyuko in the lineup eventually. So easy that characters like Youmu or Yuugi can easily receive hundreds of extra affinity past 500 to make up the difference! Sure, they might not tank it as well, but more than well enough that the difference really doesn't matter. When I was originally thinking about farming Winner I tailored up Yuugi to replace Meiling in the first slot and she was a champ. Ultimately though, the fight was way too long and boring to farm. I commend you for sticking it out to 255 wins, though. As for Iku vs Keine... the fact is that (1) Keine has much better physical bulk, and the strongest attacks which tend to hit your tank at those levels (like Ringil) are physical, and (2) Keine's ability to buff the entire frontline instead of one char at a time makes a large difference when you're running a frontline of Keine/nuker/nuker/Reimu, as you probably should once you're that high in level. As I said before- this is boiling down to "Keine is better at Winner farming", which she certainly is. Iku's stellar MND doesn't matter when you have 500+ affinities to resist all magical attacks, and for most of the Winner fight there's little reason not to have as much offense out as you can manage. Winner's fight design is... not like most bosses in the game, long but mostly non-dangerous until the end, and that plus wanting many kills means you try to pack in a lot of damage rather than playing carefully to ensure a single win. Again, you're quoting Winner examples Kaguya annihilates random fights with her immensely powerful and defense-ignoring alltargets, does high damage on bosses, and has good utility in Stone Bowl, and LoT1 is a glass cannon's dream game until late Plus. Patchouli is vastly easier to use than in LoT2, as there are very few physical all-targets (that aren't a survivable row-target) and she's got the MND to survive most composite attacks with just a little extra investment into it (whether it's good MND gear, a little extra MND library'ing, or a few MND levelups). No, she doesn't work well against Winner, but she's great until 30F and that's like 97% of the game content. She'll eat the Rankain from Kedamagrammaton for zero damage without it being debuffed, which was important before people realized you can debuff it after the first rankain charge... oops. There's actually a surprising number of bosses that completely lack any physical damage, for that matter. Bosses with mostly physical moves, on the other hand, are pretty rare. Patch does start getting kinda slow around the end of maingame, admittedly. At that point it has to be remembered that my list tries to account for most of the game- but she's still fully viable, unlike characters like Chen and Wriggle who fall off -hard- in Plus. About specifically Remilia, Rinnosuke should (slightly) outdamage her assuming he always has proper buff support, but Remilia can cover all her own stats, has significantly more HP, and levels slightly faster. Remilia's buff support doesn't matter that much at the point of Winner, but Remilia can still top herself off more than your other frontliners to maintain a higher average buff amount for her defenses. And honestly, they've got the same base attack and similar formulas unless Rinnosuke can hit a weakness- SGS is a little better than Gungnir, mostly in defense piercing, but Remi also levels slightly faster. Composite damage formula on his other attacks is unfortunate when you aren't in 255 winner world, I recall Traumerei often hitting for same/less as Scarlet Gold unless his buffs were near max. I'd still say she's mostly outclassed in plus disk by other characters, but I wouldn't name Rinnosuke as the one to do it. She might have been ranked slightly too high on my list? Yuyuko is really, really good. Like... after beating Shikieki on 26f. But let's face it, that's dreadfully late in the game, and she's absolute dead weight on SPI-resistant bosses like Shiki and Serpent of Chaos, and she doesn't have the SP to be a good character until that point in the game either. She's pretty poor if she isn't spamming SFN. I did rank her as A-tier after that point, though, but the fact that it's over halfway through POSTgame is significant. Also honestly I'm really not a fan of World Shaking Military Rule. It's good, for opening on Winner, where all the strategies are different and you want fast damage and can totally just sit your frontline out as Reimu tanks and heals them. It's good for farming 20F fights before you're at the level to handle them. I -don't- like using it in almost any other situation, because then Rinnosuke is stuck in his spot until he dies, and it's not that hard to buff people by the time you get him. If I commented on your list otherwise, it'd probably be Kanako. I tried to use her before, and her poor HP stat made her oft-praised bulk rather laughable. Think Remilia, but with a third of her HP cut off. Her damage is also pretty underwhelming. Her only claim to fame is having the only CLD nuke in the game, the most common weakness of LoT1 bosses. Unfortunately, that means she's mediocre against every boss that -isn't- weak to CLD. Yeah I don't think its great to base all balance opinions of the characters off of Winner farming viability or super super late game usage in general. It's alright to take it into account but to say that "There were a lot of characters which were simply outclassed in nearly every possible way" when you're dealing with the most inflated stats in the game is a bit much. The balance for maingame is completely different, and even post/early-mid plus is vastly different to 30F levels. The Tierlist changes a lot depending on how far in you are, and a lot of those people you've put at lower tiers can suffice well enough for maingame. Of course though there are people who pretty much outclass others entirely, but during the duration of maingame its totally workable to use those who are outclassed because the gap isn't really that wide. And because there's only so many different actions that they can do it's only better for the viability of subbing in someone else who does the same thing, rather than subbing someone else in and missing out on an important unique ability in 2 which may also just make that one person soo much better for that job in the first place. I feel like skills make the balance more all over the place honestly. The biggest argument for some characters being deadweight for maingame is plus disk characters, especially ones like Utsuho who are just meh even during plus disc. But a lot of that is also just SP cost issues and less about survivability/damage capabilities. The most important part of character balance in 1 is really just how you build them, especially with regards to level up bonuses, and while you'll have characters who are better at their jobs than others no matter what you do, it's totally possible for you to make up for a character not being as great in maingame by building them really well. There's no unique skills to muddy that and make someone just objectively the much better choice for whatever thing. Well, his tier list -is- specifically for lategame; so I don't take problems with stuff like Chen being in the bottom tier. It just seemed that it was less lategame and more "winner farming efficiency" :V Meiling sure got hit hard, though. I actually considered Healer to become a decently usable heal in Plus Disk, and colorful rain doesn't go out of style, albiet less critical with Reimu/Rumia heals being more accessible and spammable. Her durability is only obsolete with when it comes to Winner, the boss of "kill it faster, not safer". And gosh, yeah, Utsuho is probably the worst character in LoT1. Even Mokou at least is passable, it's just that she's outclassed by pretty much any other option. Utsuho is a nuker without a nuke. Yes, I'm aware that my "tier list" is centered around 30F farming (though not specifically WINNER farming - much of my assessment works for Serpent of Chaos too, as well as the various V3 bosses). The reason why I brought it up is that a common complaint I read - even on the current thread - is that LoT1 was somehow more balanced than LoT2 currently is. That's absolutely not true from my experience. Perhaps in the early-mid game, yes, LoT1 had more variety of chars than LoT2 - though the more stringent requirements for bosses meant that you still had little room for changing, and LoT1 was much more punishing than LoT2 about that, what with the worse leaked XP mechanism and lack of reset options. But in the late game, I found the situation to be actually reversed. In LoT1, the game polarizes around a few chars which are far and away better than the others. I don't think it's an exaggeration to say that the best teams in LoT1's late-game (which, in this context, I assume to be 30F - that's the best comparison IMO to LoT2's post-27F meta) all include the same 5-6 chars, with the remaining slots being made out of a selection of 8-10 chars at most - thus leaving around half the roster in the dust. Conversely, in LoT2, I found that the way gems, library levels, and stat skill boosts work (as well as other quirks such as synergies, subclasses etc.) actually level out differences in the long run. Whereas a few chars, like Nitori or Yuugi, were impressively good at low-mid levels and a few others (like Youmu) were impressively bad, once you get past lvl 1000 the differences are much subtler. Even Nitori, often touted as the strongest LoT2 char, can be equaled in damage by any good nuker backed up by real family synergies, such as Kanako, Yukari, Tenshi and so on. And this, I think, is much preferable to how it was in LoT1. You might be right to say that the pre-30F (or pre-27F) is 97% of the game for the majority of the players. But, personally, I'd rather have more constrained choices which slowly expand as the game progresses, than a variety of viable choices which eventually bottles up to a narrow selection in the end-game. Especially when the latter scenario is applied to a game which harshly punishes you for using "crutch characters" (chars good at low levels but bad at high levels) like Remilia. EDIT: Also, please don't assume that the stat weights I assumed for my Excel sheet are based on lvl 3000 chars. I did the measuring on lvl 1100-1300 chars, and most of the "polarization" (like, say, Youmu's HP stat soaring above other nukers) starts to become visible as "early" as lvl 700. I agree with the basic point elminister's making. Labyrinth 1's more a game you kind of want to tierwhore on. Lab 2's much more forgiving and casual about it, it has its OP and sorta bad characters, but the gap is shorter between the two. Lab 1's a game I'd definitely "guide" a friend through to help them avoid wasting time on useless characters or worse, ruining them with bad levelup bonuses, but I'd let them find their own way through labyrinth 2, if that makes sense. Also, super hyped about the coming update, even though I've already made up my mind that the ultra late game is the worst part of Labyrinth 2 by a noticeable margin. I already know I'm gonna have a lot to complain about in this last stretch of the game, and yet I'm thrilled to see it. Strange. That's sort of how I feel about it too^^ Unless HP and/or defensive values are raised to astronomical levels, I fail to see how anything 3peso comes up with could provide a decent challenge for my current team - which atm is almost lvl 3000 with most Mega boosts maxxed. I mean, one of the things I did like about LoT1's endgame was that it actually forced you to push the limits as much as possible, and even then, WINNER's fight always felt tactically interesting - maybe not as much as, say, Rinnosuke, but it still involved significant amounts of strategy, as you often had to react to multiple threats at once, often unpredictably so. WINNER in LoT2, on the other hand, felt a lot more tame in comparison. Sure, I was maybe a bit overlevelled, but he also felt a lot more predictable and abusable than he was in LoT1. Also, what worries me is that I dunno if the game is equipped to handle such astronomically high stats. In LoT1, by level 3000, you were about ready to kill WINNER 256 (i.e. the last challenge in the game). In LoT2, you can reach lvl 3000 in a fraction of the time it takes to reach it in LoT1, and I'm not even sure it is gonna be the maximum amount of progression we can hit. Also, in LoT1, by level 3000, a buffed Yuuka's Master Spark would hit for around 170-180 million HP iirc. In LoT2, I can hit the same amount of damage with stuff like Yukari's Shikigami + with Murakumo's boost - I'm sure that if I used Marisa with full boosts and synergies I could almost break 1 billion damage at this point. What kind of boss is supposed to handle that? I'm still hanging out at about level 1100 myself. I didn't want to overlevel for the last bits, so after defeating King I pretty much put my file on stasis. I'd hate to grind and "prepare" for it and then discover the next boss is 1300 while my team's 1700. I guess I'll just explain my thought process a bit about the character balance thing given that I was the one who most recently brought it up and it sort of expanded into an extremely in-depth analysis which I wasn't trying to suggest I did when stating my opinion. As initially stated in the post I made, everything was nothing more than how I "felt" while playing through both games. I've played LoT2 in its entirety twice minus the newest content patch and LoT once, so it's entirely possible I'm also just inherently biased towards the latter because I haven't re-experienced it and potentially picked up on problems I didn't perceive during my first playthrough. Thoughts that were constantly in the back of my mind during my first playthrough of LoT2 were - Cirno looks fun but maybe she won't do a whole lot without other Team 9 members. Oh I want to use Tenshi so I guess I'll have to ditch someone else for Iku. I like Remilia but is there any reason to use her when Meiling seems to do what she does but better? Granted these are just random examples but things like that were what I always had to question when playing through the game. When I played through LoT if I wanted to use Cirno, I'd just throw her in the party and I knew exactly what she would do without having to worry about who else I was using and if they were also in the front at the same time she was. I also think the problem is a bit exacerbated because some characters in LoT2 just seemed to pale in comparison to other characters who did the exact same thing and I'm sure if you look hard enough you can find the same problems in the first game but I didn't feel like I ever had an issue using whoever I wanted. Everyone felt like they had a specific role to do and to me, felt balanced enough among one another. That's basically it. I wasn't trying to state facts to suggest that LoT is a better game than LoT2 or anything of the sort. I was just giving my thoughts for why I personally had more fun playing through it than the sequel. Well, level 1400 ***WINNER*** has 647m HP (level 1000 was 330m, 1200 was 476m), while level 1280 King of Chaos had 666m HP. I'm pretty sure any bosses at level 3000 are gonna have a lot more than 1b HP. If you wanted, you could probably go into the Corridor, grind some floors (a lot of floors, given 251f is around 1100), and then check Keine's Library to see what kind of HP the Corridor bosses have in the 3000s. Also wow, level 3000 huh? I stopped at 2000, maybe I should have been more ambitious in preparing for the update. I've mostly been killing time waiting for it, not like I couldn't have done more grinding. You can just level down characters anyway. 's what I'm planning on doing. I'm at like 1500, myself. Farmed gems on b11f for 300~ levels because goodness does it take a lot if you want to max all the relevant people. I don't think the final non-infinite content will go above 2000, though. Even if the corridor stops at 999 and either becomes bossless or has bosses that don't scale well enough to matter, you can always dive down to increase enemy level, look for a risky floor, and grind up scaling exp for farming Winner. Corridor enemies don't rise in exp terribly fast, unfortunately, but lv3000+ enemies will still probably give more than the heavenly touhou random fights we're likely to see on the top floor's last section(s), and Risky floors make it much easier to find obscenely high level enemies in a reasonable timeframe. I honestly hope WINNER (or whatever else boss) is gonna go way beyond level 2000, given how easy xp farming is in this game compared to LoT1. I get it that level down is an option, but that'd still feel sort of like a bummer to me. Oh, I imagine the full version will have infinite scaling winner, since he already has a level scaling system! He probably just didn't want to encourage people to overlevel to the moon fighting Winner before the actual content for those level tiers is out. Well, he just tweeted about a boss having so much hp it loops into negative values because it exceeded the 32 bit integer limit for hp (2.1 billion). I think it's just a display issue and the actual hp value can go up to 64bit limit (9.2 quint, that's 18 zeros). The timing of the tweet is nice since there is talk about worries that boss hp would be too low and apparently at least one boss will have over 2 billion hp. Although, he could also just be checking what kind of damage is deal-able at the level where you can max all the mega boosts. Well, he just tweeted about a boss having so much hp it loops into negative values because it exceeded the 32 bit integer limit for hp (2.1 billion). I think it's just a display issue and the actual hp value can go up to 64bit limit (9.2 quint, that's 18 zeros). Seeing as other values (character's stats) can already go into quintillions (screenshot proof here, you can see character's HP being over 300 billions): https://i.imgur.com/etMuNvi.png - if values can't fit in a single line, you will get empty line instead, but it is only cosmetic bug, your high stats are still there), I see no problem in increasing bosses' max HP to 64-bit limit too. Yeah, that's one of my issues with the extreme late game in general. The more digits in that half-second display, the harder it is to parse how much damage was done. ESPECIALLY when hitting multiple targets at once, a 6-7 digit number hitting all four of your characters is simply harder to accurately read than a 4-5 digit one. Not that it's impossible to work with, it's just slightly annoying to sometimes have to doubletake and figure out what just happened to who if you suspect you mistakenly identified a hundred thousand or one million. Feels like there could have been a solution to this, for example Borderlands will shorten extremely high numbers to read something like 1.65Mil instead of the whole number at once. Oh well. Little nitpicks.